The headlines don't adequately describe this fabulous sustainable home. It's not what you see but what you don't see that makes this home so special. This passive solar home was professionally designed with input from the owners with the end result being a home that is not only stunning but is totally eco-friendly and targets 100% sustainable living. The home's true North orientation maximises the benefits of passive solar heating, solar hot water and photovoltaic electricity generation. The use of innovative "Thermacell"(Insulated Concrete Form) building system, double glazing on all windows and glass doors including the seven openable skylights, use of Trombe walls and block-out curtains with pelmets make it possible to maintain a comfortable living environment without the need for additional heating and cooling. To assist with noise proofing and to provide "thermal mass" for passive heating and cooling, the internal timber framed walls are all lined with concrete bricks and R5 insulation. Ducted evaporative cooling and hydronic in-slab heating have been installed to ensure year round comfort. Photovoltaic panels with battery storage and solar hot water with mains gas back up complete this bespoke package. This fabulous home has a living area of almost 290m2, and is over four levels. The hub of the home is the kitchen which looks onto a beautiful architect designed garden with a feature sandstone cascading waterfall and easy-care gardens. The huge island bench includes a breakfast bar and lots of drawers and cupboard storage space. Caesarstone benchtops are throughout the kitchen with an abundance of under-bench storage. There is an integrated refrigerator and integrated AEG appliances including dishwasher, steam wall oven, convection microwave and a four burner mains gas hotplate including two Wok burners. The kitchen's abundant storage also incorporates three pantries including a soft close pull out pantry and two roll-top storage cupboards with built in power points. 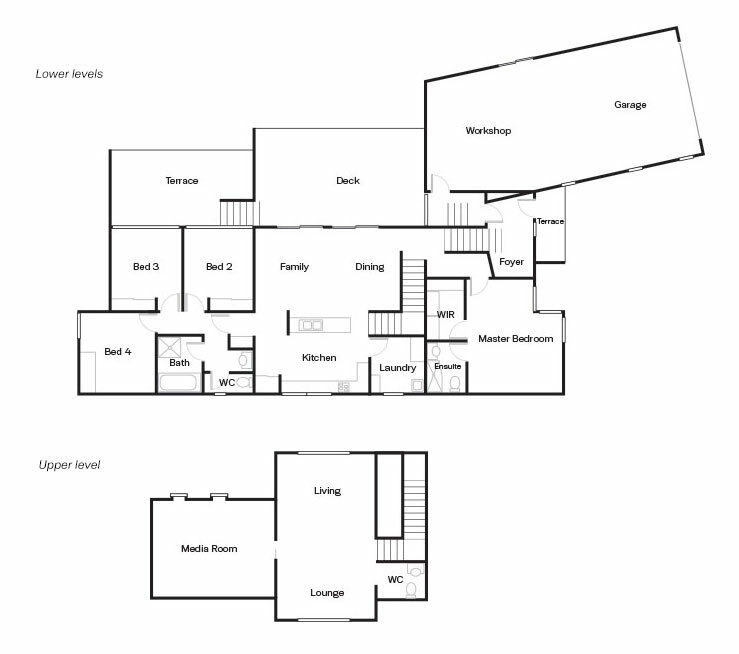 Off the kitchen is a spacious family room and dining area that then opens onto a large steel framed deck. 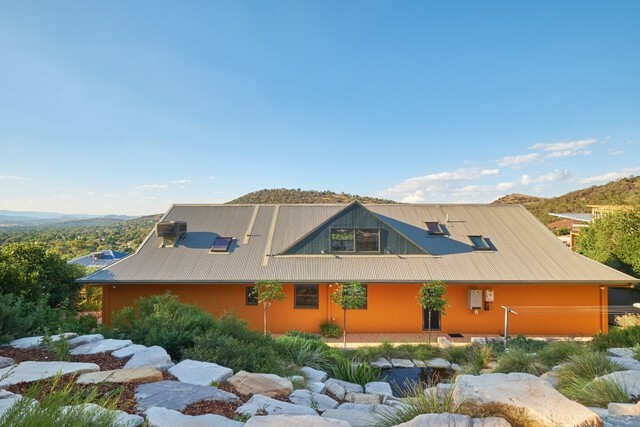 This offers magnificent panoramic views of the Murrumbidgee Corridor and Brindabella Ranges. There are shade sails overhead and a beautiful elevated Canberra native grass garden. The mains gas bayonets at each end of the deck offer flexibility for the BBQ. At the bottom of the stairs from the deck there is a private courtyard that is ideal for a hot tub spa. The lock up storage room below houses two 5,600 litre rainwater tanks and plenty of room left over. The segregated master bedroom is huge and is serviced with a large ensuite and has a hydronic heated towel rail plus walk-in dressing room and wardrobe. The two North facing bedrooms have dwarf Trombe walls to attract heat through the day and radiate it into the rooms at night. All the bedrooms have floor to ceiling built-in wardrobes. The bathroom is a "Complex" style and has floor to ceiling tiles with a lovely deep spa bath and separate shower recess and also has a hydronic heated towel rail. The laundry is large with plenty of storage and gives access to the back yard. The top level is accessed via a beautiful American White Oak staircase. This upstairs level consists of a large formal lounge and living room with its own powder room and a fabulous space for a home theatre or large home office. There are huge storage areas in the north-side and south-side wall cavities of the theatre room. The floor throughout the upstairs is also American White Oak. This home is serviced with extra power points inside and out. For the I.T. person it is also cabled with all the necessary outlets to run a business from home if that is your desire. There is a huge 84m2 four car garage with a remote door with room for four, large four wheel drive vehicles as well as a trailer plus a motorbike and workshop. 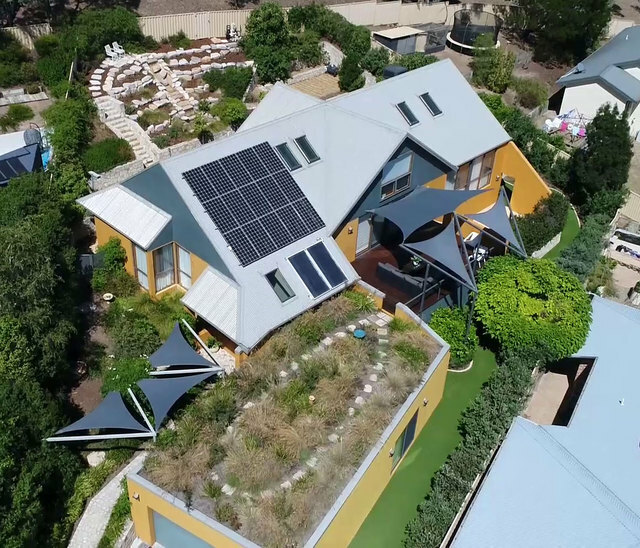 It also houses the 8kW battery charged from photovoltaic panels on the home's roof. When the battery is fully charged, excess power is sold back to the grid. When power is needed the battery is drained before power is purchased from the grid. The garage is accessed through to the home via an airlock and has a double glazed sliding door to the side allowing access to the delightful side garden. The backyard area has been beautifully landscaped with a cascade sandstone waterfall plus lots of sandstone feature stone throughout the garden. The gardens are easy-care and require minimum maintenance and have many fruit trees scattered throughout with a large vegetable garden to supply home grown produce. The two 5,600 litre rainwater storage tanks have been piped through the gardens and are serviced by a pump to give plenty of water pressure. The home is located in a quiet cul-de-sac, surrounded by quality homes with ready access to numerous walking trails to explore with family and friends.